The B-24 Liberator was the mainstay of the US Army Air Force's strategic bombing effort in the China-Burma-India (CBI) Theatre from 1942 until the end of the war in 1945. 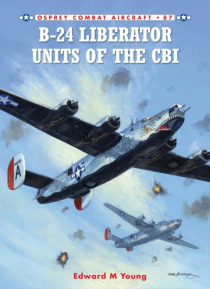 With longer range and a greater load-carrying capacity than the B-17, the B-24 was well-suited to the demands of the CBI. The CBI's two air forces, the Tenth in India and the Fourteenth in China, each had one heavy bomb group equ… ipped with Liberators. These two groups, the 7th and the 308th, carried the war to the Japanese across China and South East Asia, flying over some of the most difficult terrain in the world. The 308th had the added burden of having to carry its own fuel and bombs over the Himalayan 'Hump' from India to China in support of its missions. Despite the hardships and extreme distances from sources of supply, both units compiled a notable record, each winning two Distinguished Unit Citations.